A price on carbon would fund investments in clean energy under the new plan. 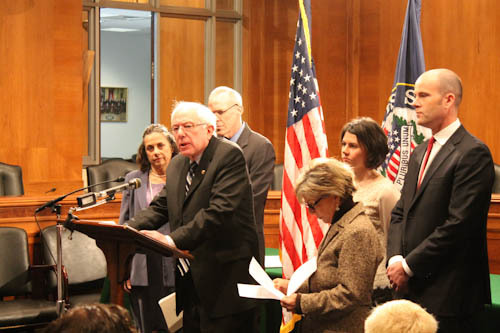 Senators Bernie Sanders and Barbara Boxer, along with representatives of many mainstream environmental groups and think tanks, announce comprehensive climate change legislation, February 14, 2013, on Capitol Hill. Photo by George Zornick. In the midst of a heightened conversation on combating climate change—as thousands of protestors are headed to DC this weekend to protest against the Keystone XL pipeline project, and as President Obama increasingly uses his bully pulpit to talk about the issue—the Senate is now jumping into the fray. A price on carbon or methane equivalent of $20 per ton. That amount rises 5.6 percent annually for ten years. The carbon price applies only to “upstream” producers, that is, the points of origin for fossil fuels—coal mines, oil refineries, natural gas processing points and so on. It would also apply to any imported fossil fuels, at the point of importation. The price also applies to only 2,869 of the largest fossil fuel polluters, which covers 85 percent of US greenhouse gas emissions. The carbon price would raise $1.2 trillion in revenue, according to the CBO. A large portion of that revenue would go towards investments in clean energy and energy efficiency: weatherizing 1 million homes per year, tripling the federal budget for energy research and development via ARPA-E, and creating a $500 billion sustainable technologies finance program, and providing worker training for clean energy technologies, among other initiatives. Using revenue from the carbon price and from ending subsidies to oil and gas companies, the Sanders-Boxer legislation would also pay $300 billion towards deficit reduction. Since this would likely boost natural gas production, the bill contains several fracking safeguards: it ends current fracking exemptions from the Safe Drinking Water Act, and heightens disclosure requirements for fracking chemicals. But both Sanders and Boxer think the bill can create a serious public discussion on climate change that could lead to its passage. They’ve mobilized several mainstream environmental groups to fan out across the country and whip up support: Bill McKibben, president of 350.org, spoke at Thursday morning’s announcement, as did representatives from the Center for American Progress, the Sierra Club, Public Citizen, and the National Community Action Foundation. In other words, this isn’t a one-off messaging bill: they want to try to get it passed. The one thing Boxer can control, as chair of the Senate Environment and Public Works Committee, is hearings and mark-ups on this bill, which she anticipates will happen this spring. The first step for the bill’s defenders will be focusing national attention on these hearings. Already, protestors have been marching in Washington against the Keystone pipeline, George Zornick reports.